His power: No superpowers. The Punisher is just a one-man killing machine, highly trained in combat, weapons, and intelligence. 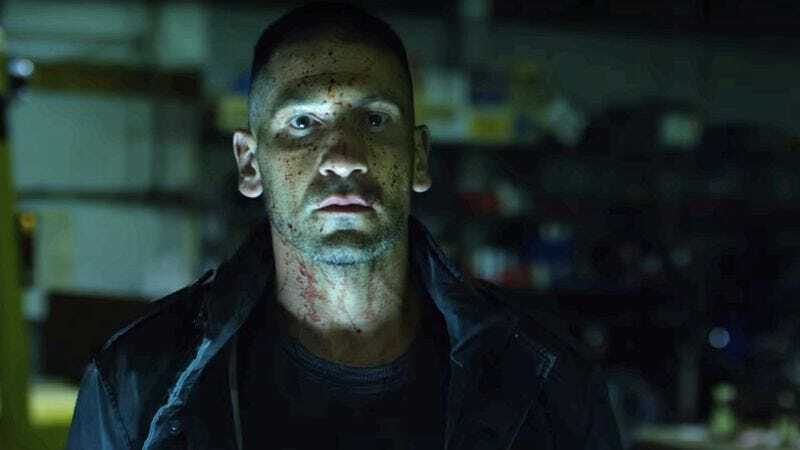 His story: Frank Castle was a decorated war hero who returned home from Afghanistan to his wife and son, only to have them killed during a botched sting operation by the police that turned into a multi-gang shootout. Once he recovered from a bullet to the brain, Castle dedicated himself to taking out every criminal involved in the fight that killed his loved ones. He starts inflicting heavy casualties, leading to conflict with not only the police but Daredevil, who eventually aids in his capture. Put on trial, he eventually receives life without parole, but is freed from prison by Wilson Fisk, a.k.a. Kingpin. He succeeds in tracking and taking out most of those affiliated with the gangs in question, ending up both assisting Daredevil in his own battle, and eventually killing the man responsible for arranging the whole setup, his former military leader, Colonel Ray Schoonover. While dispatching of Schoonover, he uncovers a secret room in the man’s shed containing a vast arsenal and body armor, where he designs the skull logo for the vigilante persona he’s adopted. Currently, the Punisher is: In New York, punishing the guilty. Where will we see him next? It’s been announced he’s getting his own series, but as of yet it’s unknown if he’ll appear there first, or in Netflix team-up series The Defenders, or possibly a cameo in Iron Fist.